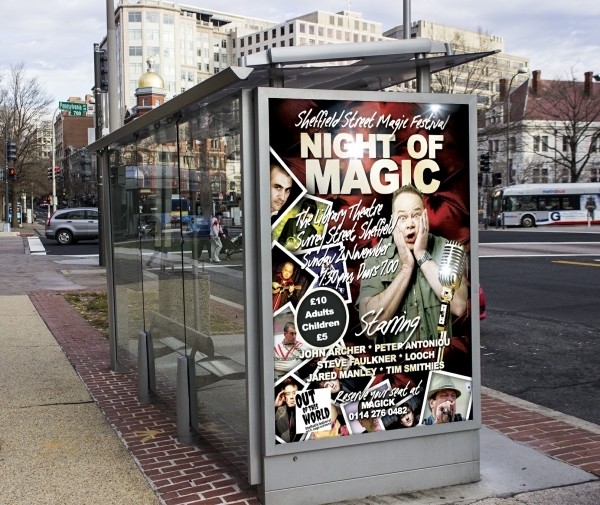 Posters are now available for the Sunday Night of Magic at Sheffield’s Library Theatre on 2 November. As with the general Street Magic Festival posters they are available in two sizes: A3 (397 x 420 mm, approximately 11.7 x 16.5 inches) and A4 (210 x 297 mm, approximately 8.27 x 11.7 inches). Again, if you have a printer I can email a copy to you as a pdf (tell me which size you require) or you can pick one (or more!) up from Magick during opening hours (11:00 to 5:30 any day except Thursday or Sunday). Message me, email me, text me or ring 0114 276 0482. In fact it’s such a great bill that for a moment there I was tempted to use the adjective ‘awesome’. Phew. Please tell all your friends, family, lovers, co-workers, fellow Facebookers, gym members, Twitterers, acquaintances, enemies and that guy in the pub you nod to on Thursdays, tickets can be obtained now from Magick, 82 Broad Street, Sheffield, S2 5TG. Or by ringing us on 0114 276 0482 during opening hours (11:00 a.m. to 5:30 p.m. every day except Thursdays and Sundays). You can pay by cash, Paypal or any major debit or credit card. Don’t miss the bus… it’ll be magic! Morning Russell I can put up some posters locally . Plus in studio. Possibly A4.